As a highly technical specialty lubricants formulator and manufacturer, Syn-Tech Ltd. evaluates each application as a unique set of parameters for a correct lubricant match, earning the respect of many longtime customers. To prevent failures of bearings and gears, careful selection of EALs for use in marine components, combined with a good oil sampling program, are necessary. Ben Bryant, Craig Desrochers, P.E. Advances in both broach tools and broach machines have progressed the state of the art in broaching. Lubrication in mechanical power transfer systems can have superfluous or detrimental properties if not optimized relative to the surface finish of the components. A complete understanding of where the gearing will be used, the surrounding environment, and external influences is an essential starting point for achieving a quality design. 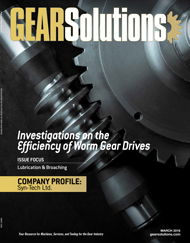 When it comes to manufacturing high-quality gears, quality control and inspection play crucial roles in meeting industry standards and a customer’s specific needs.